I know it's been so long since I did a makeup tutorial...forgive this poor soul, please. Anyways, since now I have more time on my hands...I will most likely be doing one makeup tutorial per week. This time I am trying still-shots-tutorial instead of a video tutorial, which I would need your opinion later on, regarding this matter. I did record the whole tutorial, however there were more than one thing that seemed off, so instead I diverted to still-shots-tutorial. Hope you will like them though. Okay, so I pretty much was scrolling through Pinterest when I stumbled upon a bunch of ball-joint-dolls (BJD) which looked absolutely stunning. And at that very moment I decided to recreate their makeup at least once a week. Just so you know, I didn't use the exact same colours but I was trying to get as close as I could with my minimal stock of makeup collection. And I sort of re-made it to look more 'wearable' for certain occasions. What do you think for my first trial? Was I way too off...or this was close enough...or you are just as excited as I was and can't wait to try this look for yourself? 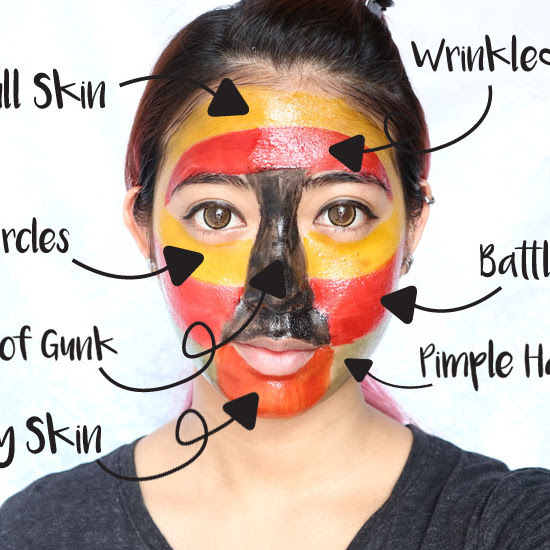 And since you might be in the mood to try out this look, here's a quick tutorial run-through just for you! Don't worry it isn't hard, trust me because I am probably even more noob than you are when it comes to make up. 1. Use an appropriate eyeshadow brush that picks up colours well. 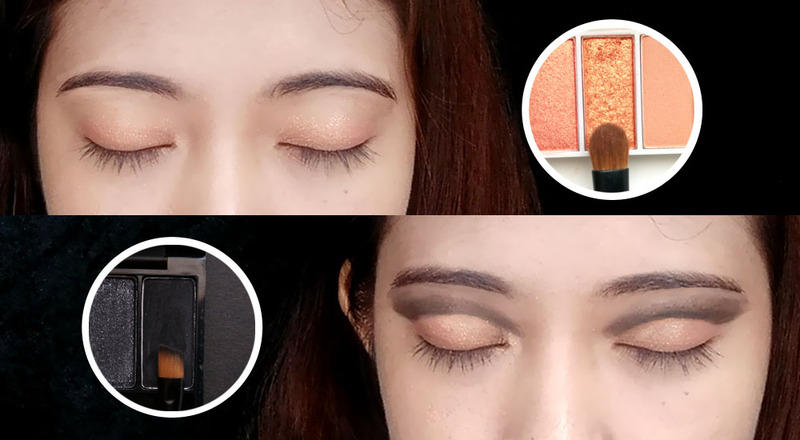 Cover your whole eyelid with a gold eyeshadow, for this tutorial I am using W.Lab Pocket Shadow Palette, Kaffir Lilly. 2. Then using an angled-eyeshadow-brush, carefully draw a clear-cut line with black eyeshadow, like in the image. Once you have a the solid line, use a normal eyeshadow brush to blend it upwards. 3. 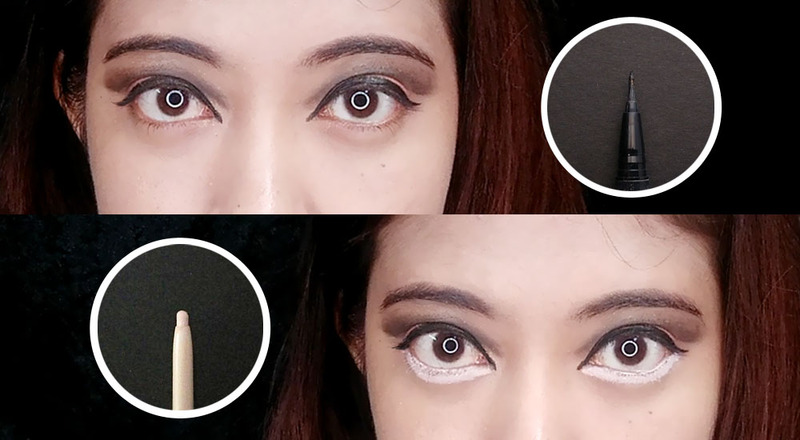 Shape your eyes into anime-like eyes with an eyeliner. 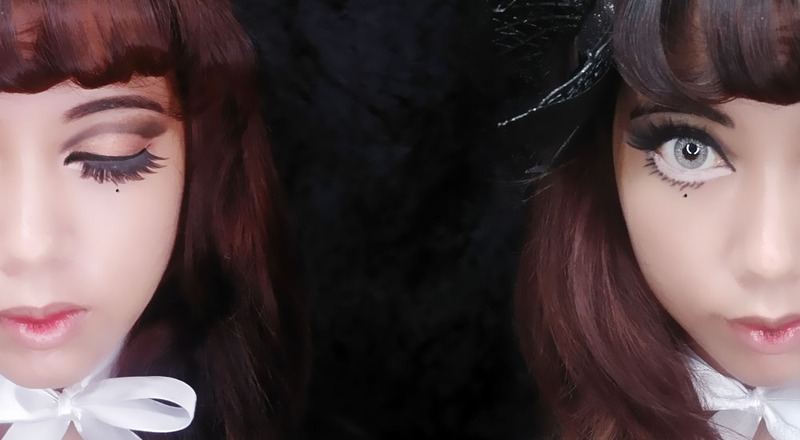 For this look, I thickened the front of the eyeliner and created a thinner end to make it similar to the eyes of the BJD. 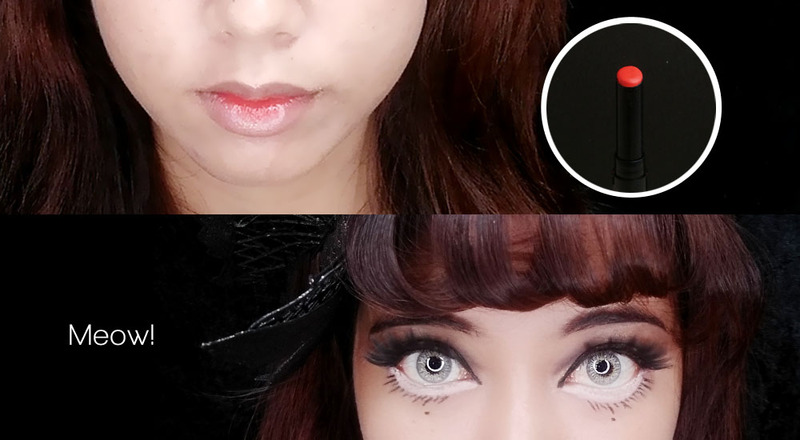 Also try to extend the inner eyeline, to give the illusion of bigger and wider eyes. 4. Using a white eyeliner, draw a thick line below your bottom lashes and don't forget to colour your waterline too. 5. Once completed the thick white line, use the black eyeliner to draw fake eyelashes. This is very similar to creating the Twiggy look. 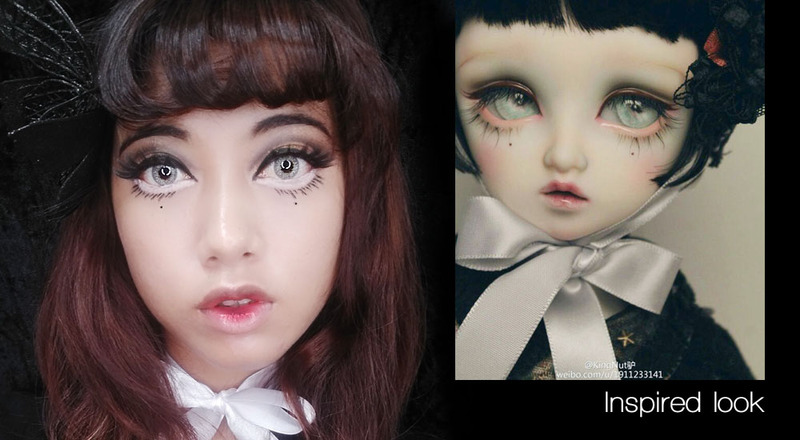 Also, since this BJD has two dots under her eyes, I drew that in too. 6. Make sure to add those fake eyelashes to this look. 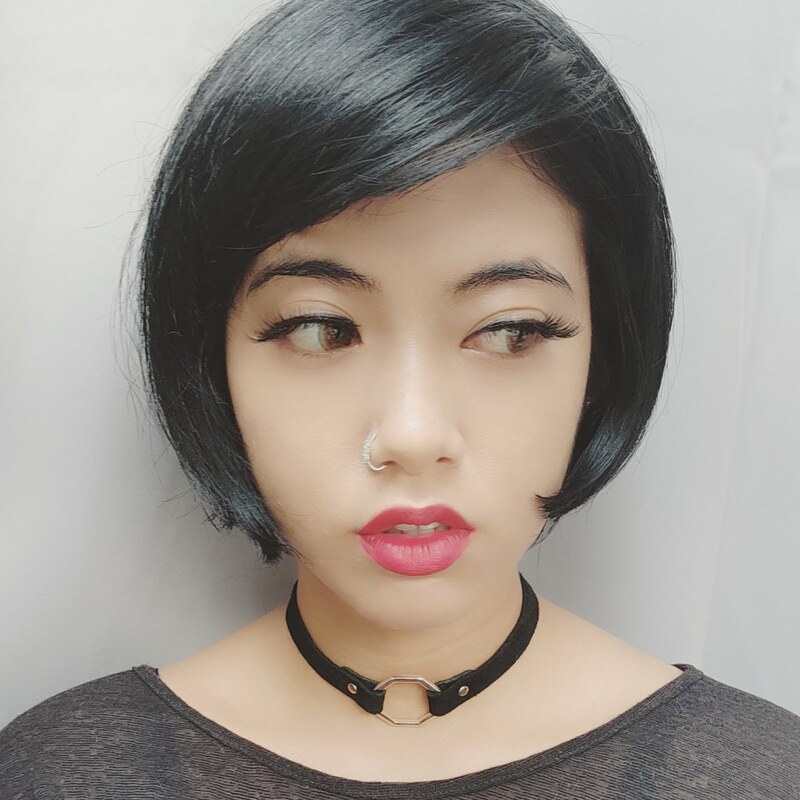 Trust me, this look will never be complete without the dramatic fake eyelashes! Doesn't it instantly make the whole look pop?! 7. To get the glassy lips just like her's, use any colourless lip gloss as the base then dab only in the middle area (top and bottom) of your lips with an orange/red lipstick. 8. 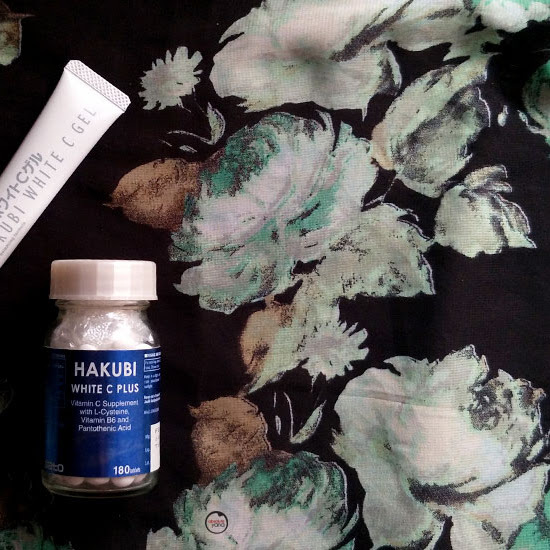 To complete this whole look, I wore my light grey doll-eyes lens. For my hair, I tried re-creating the same front hair by 'dramatically' curling it inwards. Of course, if you have similar black accessories, then you can throw that on too. See! Told you it was easy! Now wouldn't this make a good Halloween makeup too? Let me know in the comment box below what do you think about this look overall and would you want to try this out for Halloween this year. 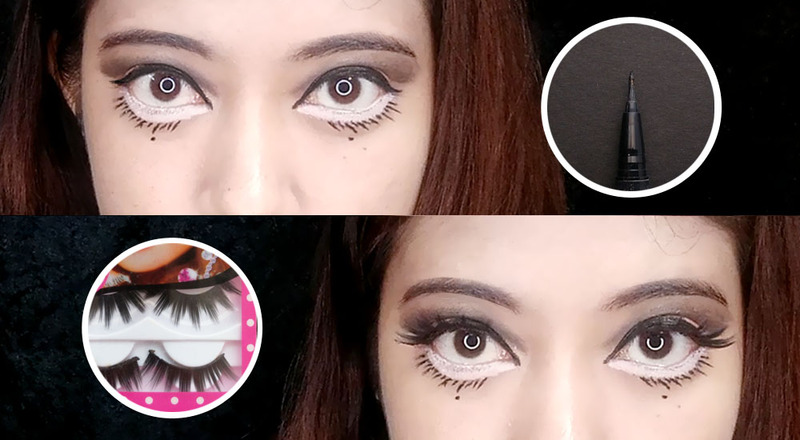 Also, do let me know if you prefer this kind of tutorial or the classic video tutorial for the future makeup tutorials, or you would like to see both. OMG babe, I'm so impressed with this tutorial. You're so talented! i am absolutely not a makeup fan but seeing your tutorial here i am amaze. Your editing is really good too. OMG babe you are so talented, ive always wanted to do this whole face painting for Halloween and all, well ive tried and i end up looking horrible hahaha. Need to work on my makeup skills more. OMG! Look alike! My friend love this doll too. You are so good in doing this! Thanks for sharing. I guess, I still need to pratice a lot in order to make this look! I love stage makeup - I really wish someone would do me up for halloween!